We forage for stories and events featuring intersting small family farms, artisans, and authors, all with one thing in common…a belief in treating the earth, animals and workers with respect and dignity. 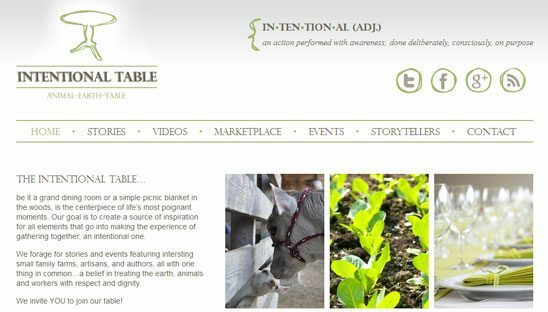 We branded Intentional Table’s custom WordPress website with a soft earthy tone feel. Sections include: Stories, recent tweet feed, video galley post, events plugin and inserted the Amazon store as an iFrame and styled it to match website.